This month we want to spotlight a volunteer family that has helped in so many ways.Our February 2013 volunteer family is the Longs. Jeff, LaRae and Keston Long have helped us in several ways in the little over a year that I have known them. LaRae saw a flyer about our first Project Christmas Basket 2012, at her work. She emailed and said she wanted to help and we have been friends since. LaRae has helped with every event we have had, she helps on a weekly basis and anytime I asked her for help she is eager and happy to do it. She helped plan our Sweet Corn Festival fund raiser and was there dressed to draw attention and “wow” the crowd. 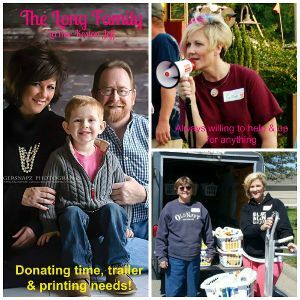 She and husband Jeff own the UPS store in Poplar Bluff, MO and the UPS store in Carbondale, IL, they have used their business to print flyers, information sheets, letter head sheets, T-shirts and much more and donated their time and expense. They have allowed us to use their enclosed trailer to pickup supplies, deliver baskets and haul items to our events multiple times. Keston has helped put stickers on the items for the baskets and was there when we loaded up items for our Spring Clean Event. We want to thank them for their support and eagerness to help us at LBFOL. If you need printing or other mail services done please contact them at the UPS store links above. If you would like to donate in honor of the Long Family you can do so at our pay pal link or through our mailing address, all donations are tax deductible and what better way to show this family how much we love and appreciate them.